In an interview today on CNN’s The Situation Room with Wolf Blitzer, GOP presidential candidate and Texas Governor Rick Perry spoke with Wolf Blitzer on a wide range of topics from gays serving openly in the U.S. military to participation in upcoming debates. A full transcript of the interview will be posted on CNN.com and a highlight is after the jump. PERRY: But the president said he would not allow them to take those specific cuts. So that’s on the president. My point is this. If we allow our military to get cut as much as this president is talking about allowing it to be cut, you could have another Pearl Harbor in this country. BLITZER: What does that mean, another Pearl Harbor? PERRY: Well — well, that means that a North Korea or an Iran or — or a Syria could attack the United States. I mean we’ve got an Iran that is working toward having a nuclear weapon. PERRY: They have clearly said that Israel is first and the United States is second. BLITZER: But don’t you think that if Iran and North Korea or Syria attacked the United States, they’d be obliterated by the United States? BLITZER: — we have thousands of nuclear warheads. 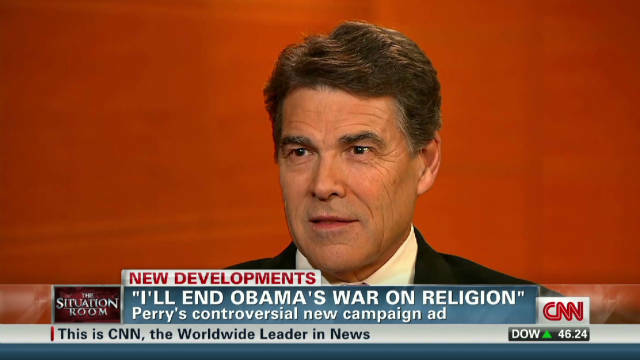 PERRY: But my — my point is why have that — I mean why give it — we’re — we’re sending messages that we’re weak. You know, this president, whether it was in ’09 with the Green Revolution, whether it was not working to get a — a transition to a person we could work with in Egypt, whether it was leading from the rear in Libya. I mean the message keeps being sent clearly that if you’re an ally of the United States, don’t count on us. And if you’re an enemy, don’t worry about us.